It took me a few weeks to watch this movie. I turned it on. I turned it off. Every time I turned it on I had to look something up and I would get so involved in what I was reading I would run out of time. I wrote this after I was inspired by what I saw about the people of Bolivia. Very informative and very inspiring. You realize WE are all in this together and it’s so important to remain hyper vigilant when it comes to our water. Here is the New York Times Review. 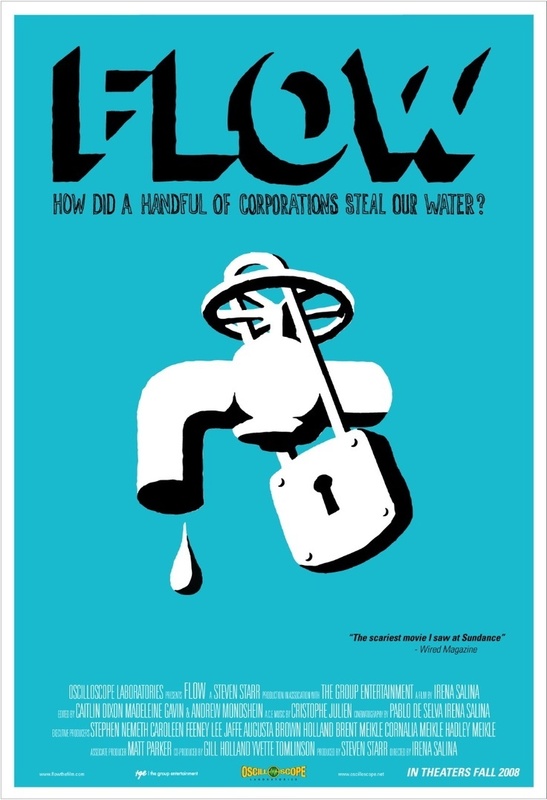 “A documentary and a three-alarm warning, “Flow” dives into our planet’s most essential resource — and third-largest industry — to find pollution, scarcity, human suffering and corporate profit. And that’s just in the United States. Yet Irena Salina’s astonishingly wide-ranging film is less depressing than galvanizing, an informed and heartfelt examination of the tug of war between public health and private interests. From the dubious quality of our tap water (possibly laced with rocket fuel) to the terrifyingly unpoliced contents of bottled brands (one company pumped from the vicinity of a Superfund site), the movie ruthlessly dismantles our assumptions about water safety and government oversight. There was one funny bit by Penn and Teller. This is about the Nestle Issue in Michigan. Nestle is everywhere. They are here in Florida and they now own my beloved Poland Springs Water. Not only stealing the water that doesn’t belong to them but causing people’s wells to go dry. Pumping during a drought. Remember it’s Nestle’s CEO that believes that water is not a human right and should be privatized. The company notorious for sending out hordes of ‘internet warriors’ to defend the company and its actions online in comments and message boards (perhaps we’ll find some below) even takes a firm stance behind Monsanto’s GMOs and their ‘proven safety’. In fact, the former Nestle CEO actually says that his idea of water privatization is very similar to Monsanto’s GMOs. In a video interview, Nestle Chairman Peter Brabeck-Letmathe states that there has never been ‘one illness’ ever caused from the consumption of GMOs. This is why I’m keeping my well. Your all invited to come get your water here. What I learned from “Flow” is that there are some magnificent people in the world and we truly are in this together. This entry was posted in clean water, corporations, documentaries and tagged Aqua Para Todos, Flow for the love of water, Nestle, Penn and Teller, Poland Springs water, privitizing water, water is life.